As you build your career in the music industry, you are going to have a lot of questions about how the music business works. The most important place to begin is to ask the right questions. When you ask the right questions, your chances of making it in music (and living the life you've always dreamed about) go WAY up. Success-Minded Question #1: Why Do Record Companies And Bands Choose To Work With Some Musicians And Not Others? Happen to be at the right place at the right time. This means they made the perfect connection with someone in the music industry who saw something special in them and gave them a big opportunity that other musicians weren't lucky enough to get. This is not true. Of course record companies do expect you to have good musical skills, but your musical skills are not enough to make you successful. No matter how good your skills are, there are thousands of musicians who are just as good (or better) than you on your instrument. To stand out, you also need the right mindset, personality, attitude and ability to add value in other ways. When you know what those things are and take action to develop them, making it in music becomes easy. Success-Minded Question #2: How Can I Achieve Financial Security In The Music Business? They assume that all musicians are destined to struggle with money. They look for a job in the music industry instead of thinking about themselves as entrepreneurs in music. Independent - if something was to happen to one of your income streams, your other sources of income continue to support you financially. Congruent - all of your income streams must be aligned with your primary goal(s) in the music industry. Residual - your income streams must pay you over and over again (ideally forever). Passive - your income streams should generate money continuously after the work is done. When you run your music career like a business and build multiple streams of income, earning 6-figures (or more) per year as a musician becomes a very realistic goal. Success-Minded Question #3: How Do I Turn Casual Fans Into Fanatics? Most musicians want to know “how to get more fans?”, but don't realize that the total number of fans you have means very little if your fans are just casual fans. Casual fans may enjoy listening to your music, but have no real loyalty to you or your band. When you have a loyal following of fanatical fans, not only do they actively support your music career, but they also spread the word about you and your music - helping you build your overall fan base much faster. Want to learn how to turn your fans into fanatics and get them to come to your every show? Download this free music career eGuide & learn how to make a great living as a performing musician. Success-Minded Question #4: How Can I Phase Out My Day Job And Phase In Working On My Music Career Full Time? Most musicians are told by friends and family that they need to have a backup plan as they enter the music business. This advice almost always comes from good intentions, but it hurts your chances of making it in music. Musicians who listen to this advice become trapped at their non-music related day jobs and are unable to fully focus on their music careers. Months, years and decades go by, and their music career dreams remain unrealized… sad, but true. Fortunately, it is possible for anyone (and for you) to transition from a day job into a successful music career. The first step towards this goal is to ask the right question that focus your mind on the result you want. The second step is to learn how to increase your income as a musician and build an exit strategy for leaving your day job (replacing your job’s salary with music career income). Working with a music career mentor helps you reach this goal much faster. Success-Minded Question #5: What Must I Do To Receive The Music Career Opportunities I Want? Many people enter the music industry with an entitlement mindset, expecting to be given opportunities (a record deal, high-paying gigs, position in a touring band, etc.). Few people ever ask what they have to do to earn the best opportunities to grow their careers. The secret to receiving the best music career opportunities is to add more business value (with the least amount of risk) to people and companies than anybody else will. Think about getting gigs (a common challenge for many musicians & bands). Most musicians think only about what they want (a venue to perform in) and put zero thought into what booking agents (and venue owners) want (to drive more people into the venue). These musicians make the same mistakes over and over again in their approaches to getting gigs and miss opportunities that other bands easily get. You now know some of the most important questions to ask yourself about growing your music career. The next step is to learn very specific actions you can take right now to increase your music career income, leave your day job and make a lot of money as a performing musician. 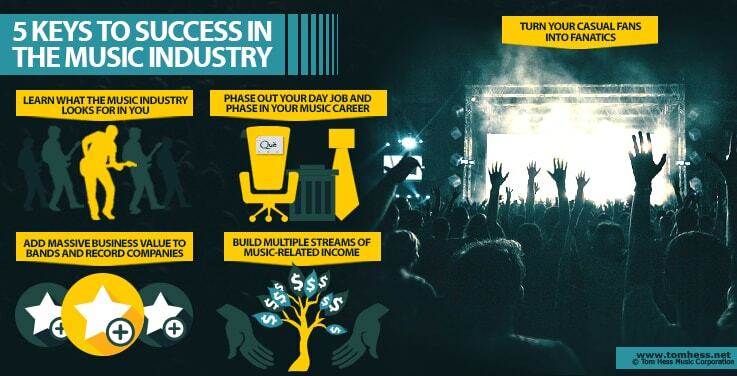 Download this free music career eGuide & learn how to build a music career you can be proud of. Learn how to find work in the music business.